For the past year, Cooler Master has been on a mission to popularize the idea of modular cases that DIY system builders can customize and tailor to their own specific needs. That mission continues with the introduction of the MasterCase Pro 6, a refined version of the MasterCase Pro 5/5t for those who want a simpler aesthetic. 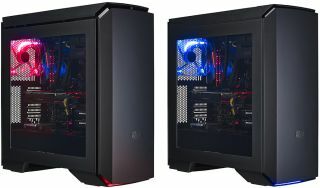 Cooler Master calls MaterCase Pro 6 the "discreetly designed mid-tower cousin" of its predecessor. The default top, front, and back panels sit mostly flush with the case. Cooler Master said it wanted more of a minimalist design that would do a better job of blending in and complementing a typical home decor rather than stand out from it. Beyond the outward looks, the MasterCase Pro 6 features the same 'FreeForm' modular system that allows for multiple exterior and interior layouts. The frame of the case is highly adjustable with parts that are easy to remove. And on the inside are two pockets with four mounting positions for SSDs, along with an interior partition panel to isolate the power supply and cables from the main part of the build. "If you have a lot of ideas about what you want inside of your case, the FreeForm modular system should provide plenty of options," Cooler Master says. "The FreeForm concept draws from Cooler Master’s quest to design a completely modular case. With it, you can easily move or remove drive cages, mount SSDs in four different locations, install large liquid cooling radiators and graphics cards, and keep your cables clean and hidden." For cooling, even though the panels sit flush, they can also pop out a smidgen to allow for increased airflow (if it's needed). It comes with two 140mm fans installed in the front and a 140mm fan in the rear. There's room to add an addition fan up front and two more up top, or you can go the liquid cooling route with support for up to two 280mm radiators. The MasterCase Pro 6 can house up to seven storage devices and two optical drives (the front panel can lean forward when opening an optical drive), including five combo 3.5-inch/2.5-inch drive bays and two more SSD bays. With the 3.5-inch drive cage installed, there's also room for graphics cards up to 11.7 inches in length, or up to 16.22 inches if the cage is removed. Cooler Master says the MasterCase Pro 6 will be available later this month for £140. No price is mentioned for the U.S. market, but we expect it to be similar. There will two versions, one with a blue LED fan and other with a red LED fan. Update: Cooler Master tells PCGamer the MasterCase Pro 6 will carry an MSRP of $175 in the U.S.